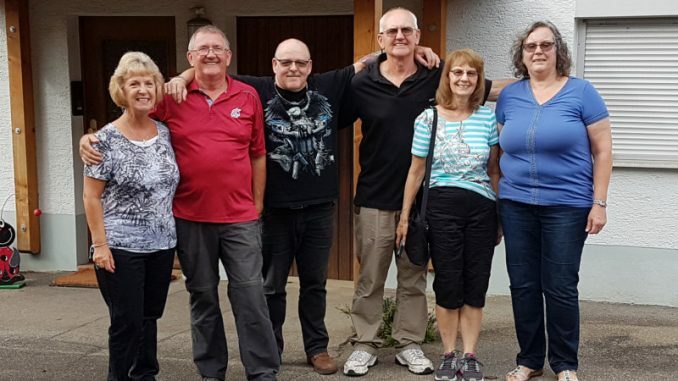 On Friday Sep 29, 2017 the grandchildren of the emigrant Johann Georg Riehle from Maehringen, Wesley and Richard Riehle arrived on the Haerten with their spouses Mary and Kay. The visit started in the city hall in Kusterdingen with a reception by the Mayor Dr. Juergen Soltau, who welcomed the guests. 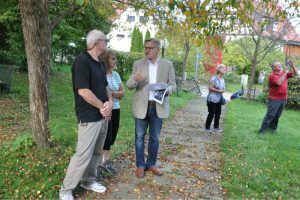 Hans Kern and Manuel Mozer from the Historical Society and a reporter from the Reutlinger Generalanzeiger (local newspaper) joined the meeting. The newspaper did help us by publishing an article about the visit. After an intensive exchange of information and an entry in the “Golden Book” of the city of Kusterdingen we said good-bye to the Mayor and went to our next station: The Klosterhof. There Manfred Wandel was already waiting for us. He guided us through with a lot of information about the historical building. By this occasion he also explained us the relationship between the former owner Georg Friedrich Riehle and his wife Friederike Katherina Wandel and the guests. 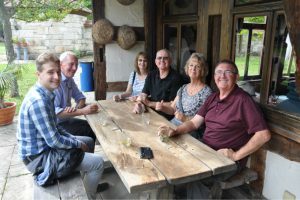 The former owner emigrated already in 1832 with his whole family to the U.S.
After a joined lunch in the restaurant “Hoefle” in Kusterdingen we continued our tour in the farm museum of the Bader family called “Hoefle” in Jettenburg. Hans Kern guided us with detailed information through this great museum. The guests have been impressed by the great presentation of the rooms and the high no. of old exposition pieces. During a small break we could taste the original apple cider of Jettenburg. This was the everyday beverage in the former days. After the visit of the farm museum our guests could check in at their hotel and relax a little bit and digest the first impressions of the days. The first day was closed by a dinner at my mother’s house. On Saturday we met at 10:30 am in front of the church in Maehringen. My former class mate, Ludwig Kemmler, explained us the church and its specialities. We arranged it, that we had been on the bell tower, when the bells started ringing. So our guests could see and hear the old bells of the church in action. Back down in the church, the wife of Ludwig, Inge, played on the organ Johann Sebastian Bach and some church songs and provided an additional highlight for our guests. They have been impressed to get a little concert in the church, especially as the organ was already in place at the time Johann Georg Riehle lived in Maehringen. After the visit of the church we have been invited in the house of Ludwig and Inge for a great lunch. The local dishes were so well done, that the recipes were exchanged as well. Around 2:00 pm we started for our next stop in the Burg street, where Siegfried and Ursula Riehle were waiting for us. In the preparation of the visit they offered us to show us the house in which Johann Georg Riehle was raised. 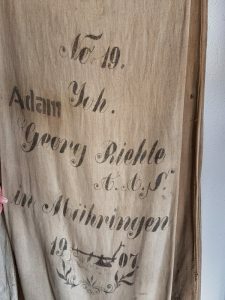 As Sigi’s father Willi had collected a lot of old pieces the excitement was great when we saw some of the original grain sacks, with the imprinted names. Immediately the guess started who may have been the owner on the sacks as there are so many similar names involved. In the barn we could see the old press for the apple cider and the cellar under the barn, where still potatoes are stored. In the barn we also discovered a bunch of additional grain sacks. Siegfried offered his cousins that they can choose one each. Their face was smiling like kids when each of them had selected one of the sacks. I’m pretty sure that this souvenir will receive a special place in America. Ursula had also invited her neighbor, Walter Riehle, who brought some city maps originating between 1887 and 1907 and showing how the city looked like in the old days. After the tour through the house and the barn Siegfried and Ursula invited us to coffee and cheese cake on their terrace. For 8:00 pm we had organized a Riehle family reunion with the descendants of the siblings of Johann Georg including my presentation about the “Emigration from the Haerten” and I was wondering how many relatives would show up. To my big surprise descendants of every siblings showed up and at the end of the day the room in the restaurant we had reserved was packed full. At this occasion I would like to thank all the relatives that they joined the reunion and provided our guest a special evening with all these German relatives. Based on the feedback of some relatives we discovered that there was something wrong with the original listed name. In the excitement of the meeting yesterday we have not noticed that Anna Magdalena died in 1908 instead as an infant child. After a further check against the church records I discovered the correct death date and therefore we have the correct order now displayed on the picture above. On Sunday morning our guest visited the harvest service (the German Thanksgiving) in the church in Maehringen and afterwards they were heading out to visit the Castle of Hohenzollern. On Monday we will have to say good-bye as our guest proceed on their German tour with a side tour in Austria. At this point I would like to thank all the people who did help to make this day exceptional. If you want to get in contact with Wesley and his family please use the contact form. 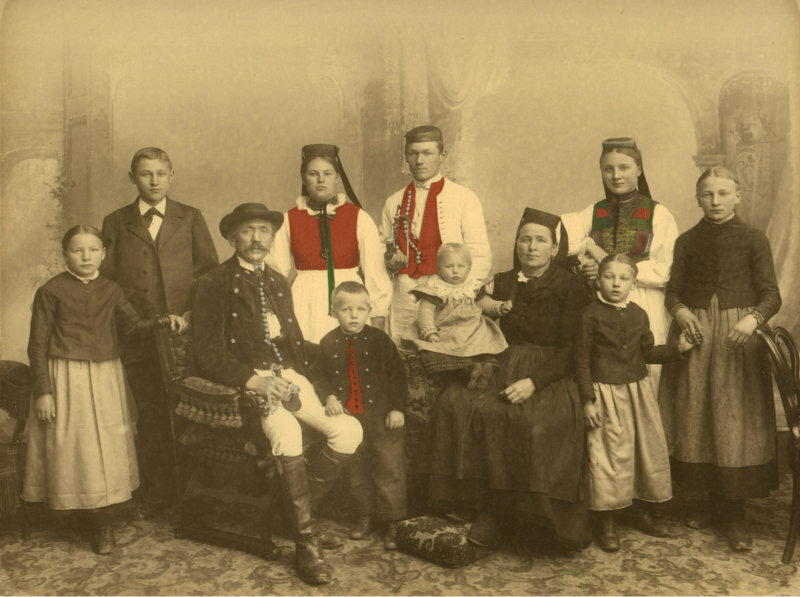 The presentation “Emigration from the Haerten” can be downloaded here.